Our family lives in the San Francisco Bay Area. We love to explore the Bay with our kids. If you live in the Bay area, you'll want to bookmark our Kid Approved Fun- Bay Area page and come back from time to time to see some of our favorite spots to visit in the area with toddlers and young kids as we update it. We'll occasionally share reviews of our experiences too. Our page is just starting to grow. 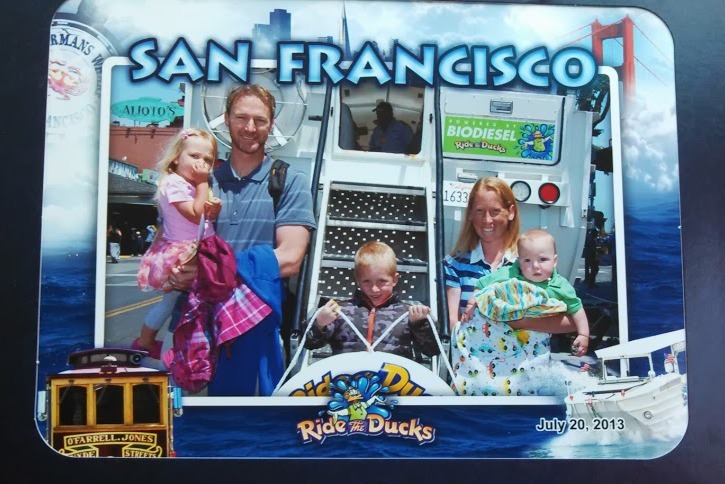 Today I am excited to share a little bit about our family's Ride the Ducks experience in San Francisco! Ride the Ducks is a a fun family tour to do in San Francisco that takes place on land... and in the water! The tour starts off in the heart of Fisherman's Wharf (right across from the giant Boudin Bakery and Fisherman's Wharf sign) and takes you around the city through Ghirardelli Square, North Beach, China Town, SOMA, etc. You can find more sightseeing details here. 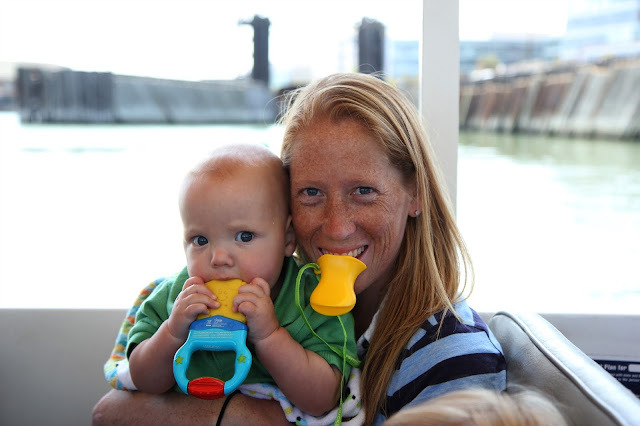 The first thing you get when you board the duck tour vehicle is one of the famous Wacky Quackers®. For us they stuffed a couple of extras in my bag too... just in case we lost one... since my kids kept dropping them as we boarded. Everyone had to try out their quacker while we waited for the tour to start. The baby thought it was the coolest teething toy ever. While we rode around the city we quacked along to the different musical selections that our tour guide had set up specifically for parts of the ride. My kids were the only younger kids on our tour, although I saw several families with young kids come off the tour just before ours. My toddler and 5-year-old sat mostly still the entire ride and quacked along and looked out the window as we drove by the historical sights in the city. The kids' favorite part was when the duck vehicle, which resembles at WWII DUKW, turned from a car/bus into a boat and launched into the Bay nearby the SF Giants Stadium. We saw loads of cool boats since the America's Cup is going on right now in SF and some of the passengers even got to take turns driving our duck vehicle when we were in the water. My kiddos were being shy and no one wanted to drive the duck, so we just kept quacking along to the music while eating the snacks that we brought. Our trip ended with a somewhat unexpected detour due to a lot of Saturday congestion along the Embarcadero. Fortunately we had a lot of snacks for the kids and the grumpy baby fell asleep or else the end of the ride would've been miserable! riding in the water... especially the big splash when we first went in! Out of all of our kids, our five year old was at the best age for this family adventure. He LOVED it. He thought the SF history was cool and just had fun participating while we quacked. Arrive 30 minutes early. Parking can sometimes be tough and then you need to walk to the tour spot... we had a hard time and almost missed our tour. Go on a weekday instead of a weekend if you can. Less traffic, less people. Bring snacks for the kiddos! Our tour was almost 2 hours instead of 1.5 because of leaving a little late and traffic... our kids would've been grumpy and whiny if we hadn't been prepared. Dress in layers. This is true anytime you go to SF. We had short sleeves, pants, fleeces, and jackets. I also had a blanket for the baby. Some of the time the tour was super windy and sometimes it was beautiful and warm. You never know, so be prepared. Use the bathroom ahead of time, there are none on board! This tour doesn't work well for those with small bladders... so this would NOT be a good idea for a child that is just being potty trained. The closest bathroom is a public restroom and on the weekends the line is long... so be prepared. If possible, request a veteran tour guide. Our tour guide was super nice, but he was pretty new and not very confident. If we'd known that we might have waited for the next tour. 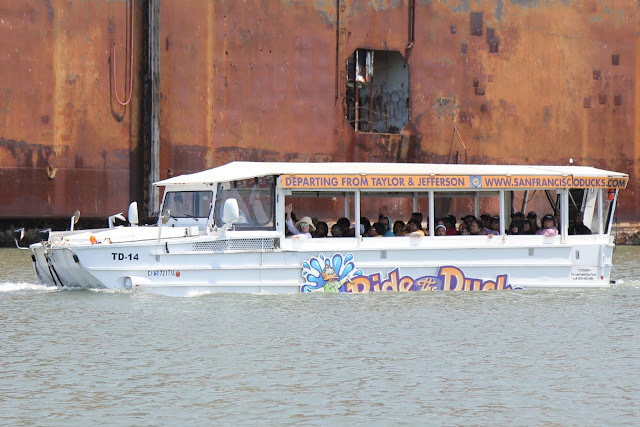 From our previous duck tour experiences the tour guide's enthusiasm and confidence is what makes the tour extra awesome. Plan your trip around naptimes or leave your littlest ones at home. Our baby didn't nap like expected on our drive into SF so he was a grump on the tour for a little bit. Fortunately he finally fell asleep while we drove around. Kids ages 0-3 are FREE on duck tours... so that is a nice perk, but just like on an airplane flight, you want to be courteous of those you ride with. If your young child can't handle being contained for that long in a small space without running around or crying, you might want to wait until they are older so that everyone gets to enjoy the tour. *You can Save $7 off Adult tickets and $5 off Child tickets when you buy online and ride before 10am. Or you can save $4 off Adult tickets and $3 off Child tickets when you buy online and ride between 10am and 11:30am or after 5pm. 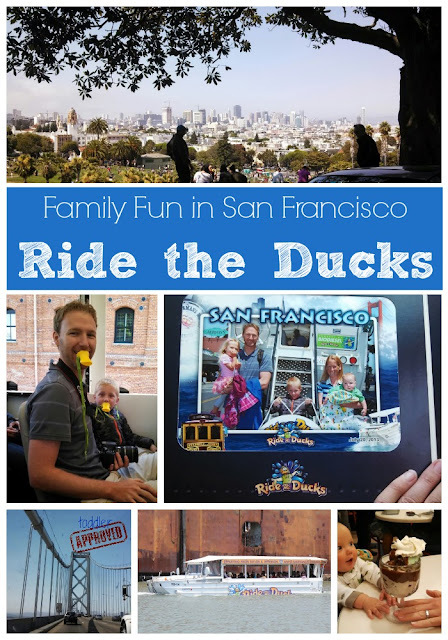 Ride the Ducks is a fun family adventure that is great for tourists who are coming to SF for the first time or families who live in the Bay and want to explore the city in a new and exciting way. We would definitely recommend the tours to family or friends who come to visit or live in the Bay! We may need to go again and join a Friday Splash Hit Tour where you get a "behind the scenes" tour of Giants stadium and then a duck tour ride where you splash into McCovey Cove. If you live in the Bay area, here are some fun Ride the Ducks promotions going on right now. 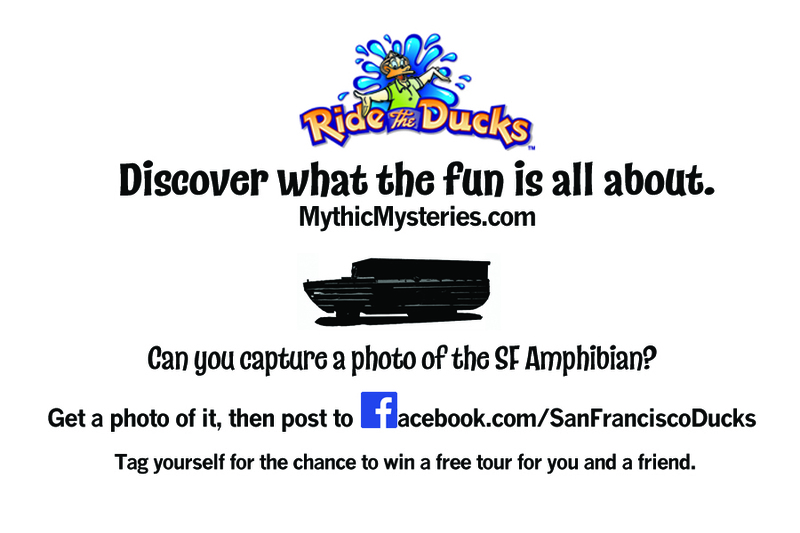 You could even win a free tour! Thanks Ride the Ducks for such a fun summer adventure!! 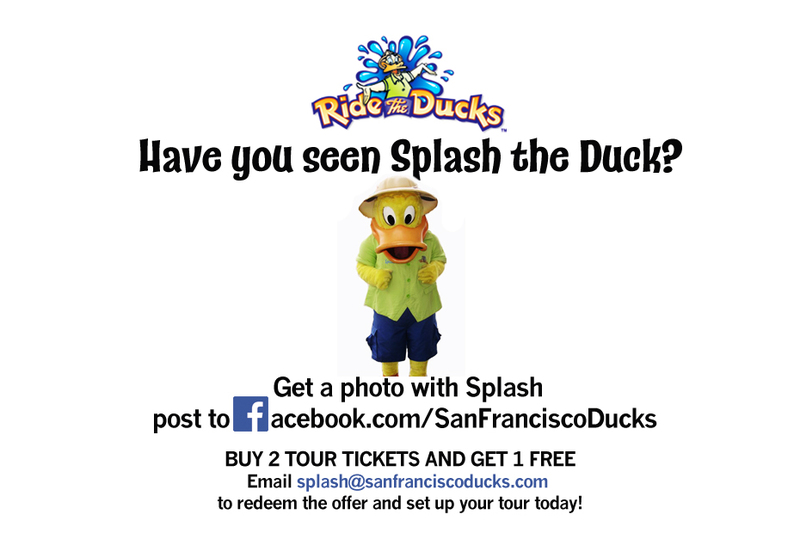 You can find Ride the Ducks on Facebook and Twitter, so stop by and click "LIKE" to find out about more cool promotions and news. Disclosure: This is a review of Ride the Ducks San Francisco. All opinions are mine. Ride the Ducks San Francisco provided me and my family with free tickets so that we could Ride the Ducks this summer and share our experience with you.